The Punk Rock ethos of Public School Teaching. We have just completed our First Five months together in AP World, and it has been a treat. What an amazing semester we have had so far! I brag on my students all of the time, but this year's kids are special. They are energetic and fun, yet academically motivated - and always answer the call when it is time to put in the work. It has made for an incredible experience as a teacher, and I hope that the students are having as much fun as I am. We have successfully balanced the hard work with the fun. We have now taken three major exams, worked diligently on our biography project (by making "historical cereal boxes" and writing papers), and even completed a Trans-Atlantic journey (through the hallways of our school) to better grasp the 16th century Atlantic Trade System. (We traded a Robo-Cop action figure for an adorable blue penguin). We've learned to write Short Answer and Long Essays, and even had a "Vans Day" - and have kept a class history of all of it! Next semester will inevitably bring about new challenges and adventures for us, but we will be ready to meet them all. Thanks for a great first five months kids. I can't wait for the next! I believe that teachers must model the power of constant learning and growth for students. To that end, I try to share with my students when my family and I travel to new places - and have new experiences. It is my hope that my students will see that I am living a life of adventure, and that I am constantly trying to learn new things, and find new inspiration. 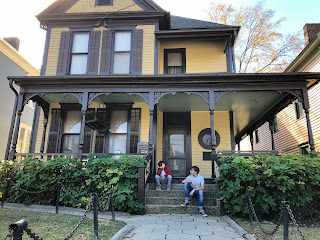 Over the course of the last year, my family and I have traveled to Bodie Island Lighthouse, enjoyed the Lost Colony play, sat on Martin Luther King Jr.'s front porch in Atlanta, and saw Hamilton. I feel so grateful to be able to experience these amazing opportunities to live into new experiences. It is my hope that by sharing it with my students, it has the potential to transform my teaching in a manner that will enable my students to better understand the power of learning and growth, reflected in my passionate commitment to teaching, and a continued life of adventures. But it will not end with my travel. We will once again take two busloads of students to Philadelphia, Washington DC, and the University of Virginia this May. Why? To learn new things, and find new inspiration. 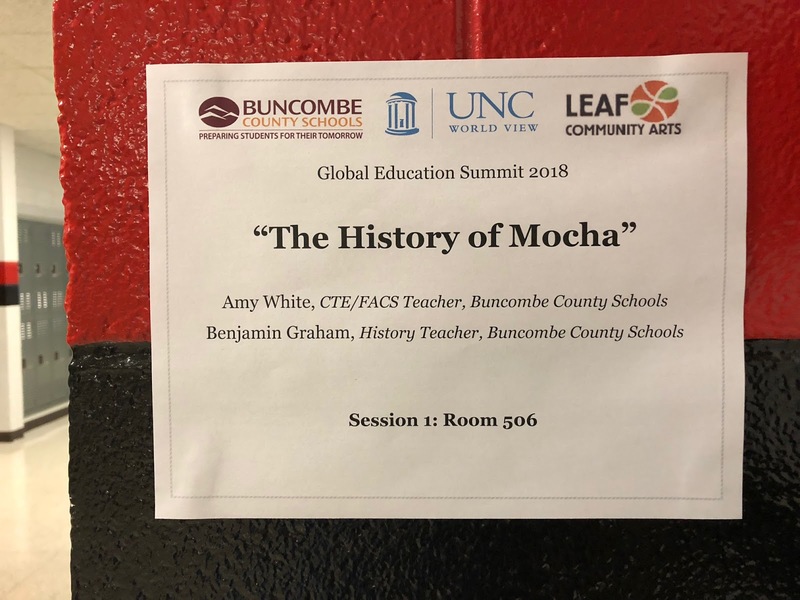 I had a blast presenting at the World View Global Education conference last month, with my good friend ( and amazing teacher) Amy White. 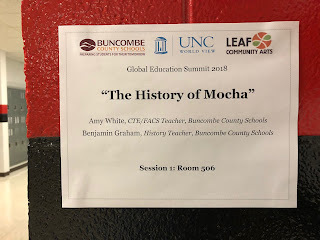 She teaches Foods and Pro Start, and we worked together to rock the history of global foods, and how to best incorporate it in the classroom, for maximum impact among our students. We focused on coffee, chocolate, and sugar. I loved it, and look forward to more opportunities to bring what we do in our classrooms out into the wider world. Last school year was my hardest school year yet. Though I had great classes, and was able to enjoy teaching some wonderful students, events outside of the classroom were challenging. School shootings as a weekly event, student deaths at our high school, immigration raids on our students' neighborhoods, and a rising normalization of intolerance in our public sphere - it all left me feeling empty. So, this summer was an important time for me - a reprieve, a chance to recharge myself, and lean into my hopes. I was looking forward to it. But it is also a fact that every Summer I love reworking my class syllabus, and trying out new, creative ways to teach. Some things work, and some things don't - and that's okay, because it is what helps me grow as a teacher. But after last year, I felt the need to rethink my classroom environment. You see, one of the greatest gifts of being a teacher is our unique ability to build a culture in our classroom - even if it is only for an hour a day. It is just amazing to build a tiny world where expectations and norms can appeal to the best versions of ourselves. 2. BE FRIENDLY, AND WHEN IN DOUBT, BE KIND. 3. BE YOURSELF, AND LET YOUR FREAK FLAG FLY. 4. TELL THE TRUTH, AND PLAY FAIR. 6. ASK LOTS OF QUESTIONS, AND ASK FOR HELP. 7. DO NOT HIT PEOPLE. 8. DO NOT USE YOUR DEVICE/PHONE UNLESS INSTRUCTED. So here's to a new school year, and hope that springs eternal. I can't wait to get started. We spent the long weekend in Chicago (by way of Louisville, Cincinnati, and Knoxville). Though I've said it many times before, traveling gives us new eyes - and these students have experienced much. From dinosaur fossils, and the man eating lions of Tsavo, to the enormity of the Willis Tower, to the Institute of Art (where they saw the works of Picasso, Monet, Caravaggio, Warhol, and Pollock), to the Blue Man Group performance, to an architectural tour of Chicago by boat, and (of course) a Chicago Fire soccer match - these students will hopefully have their eyes open a bit wider from henceforth. I love to learn new things. I love to teach. I love to travel. And I love these kids. I hope they learned as much as I did. I love being a teacher. I love my students, my school, my colleagues, and history. And I most love being a parent to my two children - each of whom have incredible teachers. In North Carolina, we currently invest 9.4% LESS than we did ten years ago in school funding (adjusted for inflation). We are the tenth largest state in the US, yet currently rank 37th in school funding. This is why a 42 NC public school systems, including mine, shut down today. We can do better than this in NC. We MUST do better than this. My students were scared to be at school yesterday. One student politely asked me to keep our door closed while in class. Another asked to be escorted to the bathroom. Over a third of my student simply sis not come to school. It was a surreal day, and was also ridiculous. My kids should not be afraid to attend a public school. We can do so much better. I have been a public school teacher for 18 years. This is the first time I have witnessed this level of anxiety from my students, concerning the security of our school. Many elected officials are claiming that we should give people like me a firearm (and training) to better secure our students. I do not want to carry a gun to my job, and in no way do I believe that this is a reasonable solution to school safety. On the contrary, I believe that arming teachers is our government giving up, and admitting that it does not have the ability to solve this problem of school safety. What I want to see happen is for our government officials to fund our public schools adequately. How can make our students feel safe? 2. Hire more school psychologists. 3. Hire more armed law enforcement officers. 4. Invest in better school security. 5. Hire more school nurses. 6. Improve access to healthcare, and provide mental health equity. This is a start. Students should not have to be afraid to learn. They deserve better. What is Punk Rock Pedagogy? Ben Graham is a teacher, writer, and storyteller - and has been teaching high school history for 18 years. He lives just outside of Asheville, NC with his wife Jessica, their two children, and a dog named Maggie. Ben is a firm believer in bringing a punk rock ethos to teaching and parenting. He writes and reflects on ..well...everything here. The views, opinions and positions expressed by the author and those providing comments on these blogs are theirs alone, and do not necessarily reflect the views, opinions or positions of my employer.